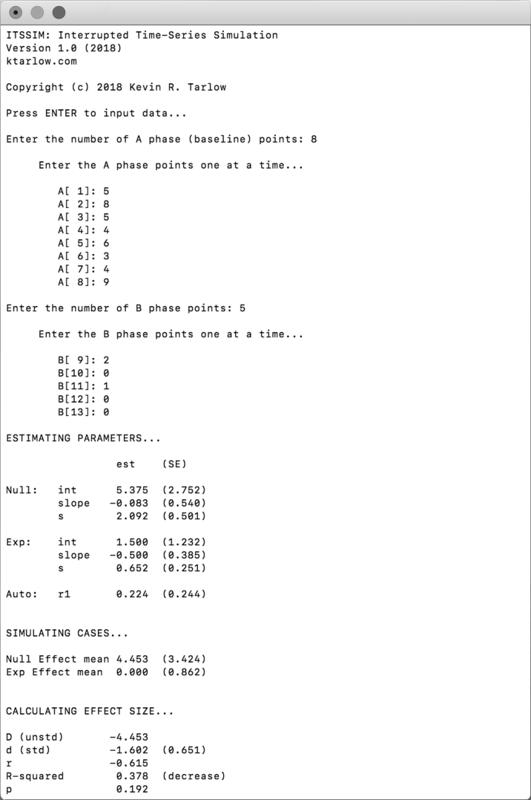 ITSSIM is a computer simulation method for analyzing single-case experimental data. ITSSIM models level, trend, variability, and autocorrelation parameters, and it yields effect size estimates appropriate for evidence-based clinical practice and meta-analysis. ITSSIM is accessible via free software download and requires no previous statistical computing experience. View a screenshot of ITSSIM software used to analyze an AB single-case data set. Parameter Estimation. Level, trend, variability, and autocorrelation parameters (and their standard errors) are estimated from the observed data. Time-Series Simulation. 100,000 artificial time-series are simulated based on the A phase parameter estimates, and another 100,000 artificial time-series are simulated based on the B phase parameter estimates. These time-series represent different null effects and intervention effects that could plausibly explain the observed A phase data and B phase data, respectively. Effect Size Calculation. Effect size statistics (including d and r) are estimated from the two distributions of simulated time-series means.